Dave Scott’s boring existence of every day life ended on December 13th, 2011. From that day, after seeing the Angel of Death in his mother’s eyes, he’s been on a fast track of experiences, from psychic intuition, to Bigfoot, to UFOs and Aliens. Dave will detail his experiences of sightings, contact, and abduction leading up to the creation of Spaced Out Radio and the meeting with ‘Carl’. DAVE SCOTT is the creator and host of Canada’s ‘Spaced Out Radio’, running Monday through Friday nights at www.spacedoutradio.com. 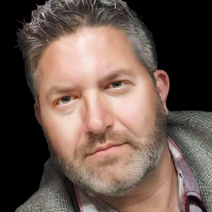 A former radio journalist, Dave graduated with a diploma in Broadcast Communications from one of Canada’s top Broadcasting Schools, BCIT, in 1998. Dave then spent 10 years in radio, mostly working in sports, before leaving the field to pursue other interests. Dave’s personal quest into the unknown started in December of 2011, when he had contact from what he calls The Angel of Death, that he saw in his mother’s eyes, which led to his first channeling experience. After this incident, Dave’s personal experiences started becoming more frequent. Paranormal experiences. Premonitions started coming true. A Big Foot sighting with two of the creatures within 100 feet of him. UFOs started appearing anytime he wanted, even though Dave had no idea what “summoning” was. And personal sightings of six extraterrestrials, one who he’s nicknamed ‘Carl’. On November 30th, 2014, Dave launched ‘Spaced Out Radio’. Dave’s decade as a journalist helped him craft his style of interview, making it comfortable and personal for his guests and listeners alike. He looks at himself as one of the only trained and experienced radio journalists, who is also an multiple experiencer of the unknown. This has proven to be very popular as now Dave broadcasts both on terrestrial and online radio to over 150,000 people nightly, as SOR is quickly becoming one of the most popular alternative radio shows in its genre.